Because all information is stored in RAM, the access speed is faster than loading the information each time from disk. Because the “value” portion of the key-value pair does not have any data type restrictions, you can cache data such as complex structures, documents, images, or a mixture of such things. If you use the in-memory cache to hold transient information, or as a read-only cache for information also stored in a database, the failure of any memcached server is not critical. For persistent data, you can fall back to an alternative lookup method using database queries, and reload the data into RAM on a different server. The typical usage environment is to modify your application so that information is read from the cache provided by memcached. If the information is not in memcached, then the data is loaded from the MySQL database and written into the cache so that future requests for the same object benefit from the cached data. 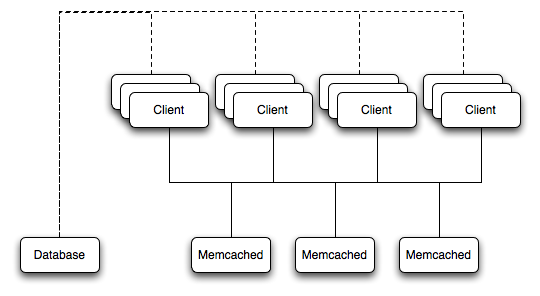 For a typical deployment layout, see Figure 16.2, “memcached Architecture Overview”. In the example structure, any of the clients can contact one of the memcached servers to request a given key. Each client is configured to talk to all of the servers shown in the illustration. Within the client, when the request is made to store the information, the key used to reference the data is hashed and this hash is then used to select one of the memcached servers. The selection of the memcached server takes place on the client before the server is contacted, keeping the process lightweight. The same algorithm is used again when a client requests the same key. The same key generates the same hash, and the same memcached server is selected as the source for the data. Using this method, the cached data is spread among all of the memcached servers, and the cached information is accessible from any client. The result is a distributed, memory-based, cache that can return information, particularly complex data and structures, much faster than natively reading the information from the database. The data held within a traditional memcached server is never stored on disk (only in RAM, which means there is no persistence of data), and the RAM cache is always populated from the backing store (a MySQL database). If a memcached server fails, the data can always be recovered from the MySQL database.